This beautiful diamond & sapphire engagement ring from Vanna K's Hand-Engraved Collection is truly for someone with discerning taste. 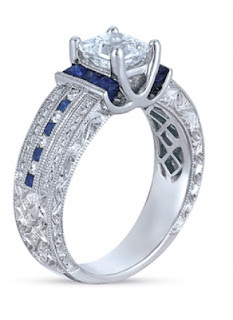 The details in this intricately-crafted platinum engagement ring are truly amazing. The 1 Carat Center Princess-cut diamond center has been given dramatic accents by the two rows of princess-cut Sapphires lining the left and right side. The bold center is softened by the rest of the beautiful band's design, which incorporates a total of 1/4 Carat round diamonds and 1/2 Carat of Ceylon Sapphires. This ring will be cherished for many generations. Visit Vanna K for additional Vintage engagement ring designs.